Olango Island off Mactan Island, which hosts a 95-hectare bird and marine sanctuary, will soon have a P160-million eco-center facility in Barangay Sabang, Olango Island, making it a first-of-its-kind facility in Southeast Asia. The 50-room, 100-bed Cebu Eco-Center (CEC) facility will be operated using wind and solar energy and will use organic products and locally supplied furniture and fixtures, but will still remain affordable for Cebuanos to enjoy. CEC Inc. president and chief executive officer Marc Canton said the joint venture group he headed will bring to reality their family’s plan to come up with a development to be able to share the natural beauty of their property with more people. ”The development of the CEC goes a long way to achieving the wish of my father and property owner, Macaraig, that we need to share this beautiful natural environment with others,” Canton said. Canton said the family thought of coming up with an eco-tourism facility after the Philippines was recognized by a French publication, Nature, as the Ecotourism Destination Awardee in April 2009. Canton also said that based on data from the International Ecotourism Society (IES), eco-tourists tend to spend more than USD 90 a day unlike regular tourists, who only spend an average of USD 60 a day. IES, in its 2007 report, also said that 15 percent of worldwide tourists fall under the eco-tourists category. ”I believe that the number of eco-tourists will still grow. Gone is the era of over consumption and people now prefer green activities,” he said. CEC Inc. partnered with Tri-Globe Capital of Canada to get funding for the project, amounting to 15 million Canadian dollars. Canton said the fund will be used for infrastructure projects on Olango Island, such as roads, bridges, water generation and low-cost housing projects that the company will undertake in the future. Right now, the company is focused on completing the first phase of the CEC facility, which will start construction in October and will be completed in one year. Within the 3.5 hectare property, the CEC will also have a scuba diving center, electronic library, observation tower, restaurant and bar, mangrove walkways, a spa and wellness center, first-aid clinic and a boat dock for small water craft. The CEC will also build classrooms since it would also want to offer lectures on indigenous flora and conservation information sessions. It will be operated with European Class “C” hotel rates, which means that a night’s stay at the facility will average about USD $40 per night. The CEC will offer various eco-activities on Olango Island, like scuba diving, island hopping, ocean kayaking, bird watching and canoeing. Experiential activities are also offered like coral or mangrove planting, shark sighting inside a shark cage and archaeological expeditions. CEC Inc. already got an acceptability rating from the Department of the Environment and Natural Resources (DENR) for its project. 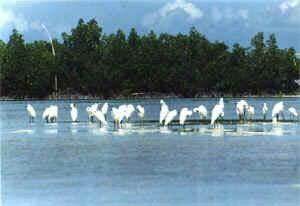 ”The DENR has already certified us for the specific use of the land,” Canton said, adding that the development will not cause any negative impact to the bird sanctuary in Olango Island, situated off Mactan.